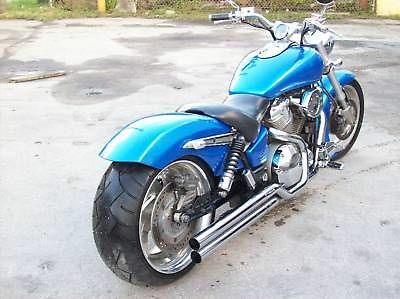 Custom motorcycle fenders are essential to your new chopper and you can get very creative in selecting fenders. Fenders can come in more then one size, ranging from a thinner rounded fender, to a much thicker option. Should you decide you want a special custom fender with some extra inches on it, the option to get an extra long custom fender is available. Another fender option a strutless custom motorcycle fender. The only difference is being able to carry a passenger with a sturdy strut or not being able to without one. Either way you will want to mount the front of the fender to the swingarm so that the fender moves with the wheel and you can mount it real tight to the tire. 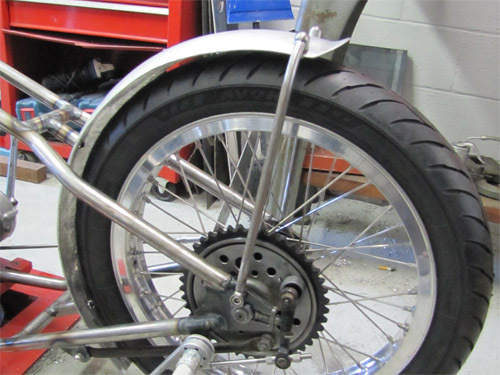 This image showing custom chopper fender struts was from Lowbrow Customs. Blanks are available as well, which include custom motorcycle fender halves. The picture above to the right is a rear fender blank. These custom fenders are purchased welded and hammered without any shape in the sides. You can also buy them ribbed. 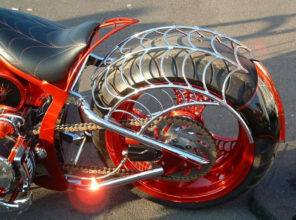 A lot of experienced motorcycle enthusiasts choose this kind of motorcycle fender because they can customize the blank, which is their own unique design, and particular to their own custom chopper. More on blanks and other fabrication tips are below. Custom Chopper Fender Blanks Guide! Buying a custom made fender is costly. So your other option is to buy a fender blank for your motorcycle and customize it yourself. That's how the builders do it if they don't have time to fabricate a fender from a piece of sheet metal. The R shows how the radius is measured. If you are adding a fender to your current ride you can buy a fender kit that simply need to be painted and bolted on giving your factory made bike a chopped or bobbed look. This fender is for a Honda VTX. It fits a 240 or 250 fat tire size and it's actually not steel or aluminum. It's fiberglass which may or may not be something you want. However, according to Goly1415 who sells it, it is strong enough to hold a passenger. When you buy fenders or fender blanks you have options when it comes to struts. Some builder like struts, other do not. A strut is what holds the fender up. Tip: if you fabricate or build from a fender blank, keep in mind that you'll save yourself some trouble if you install the bungs on your fender and work the steel strut rods to fit, rather than the other way around. So drill the olds and insert and bolt the bungs first. 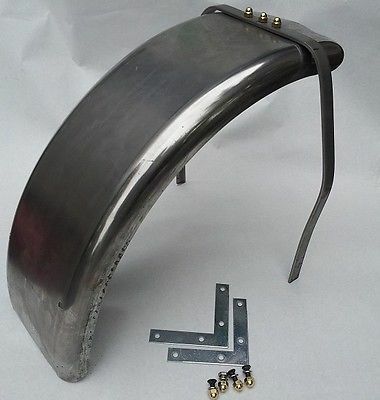 Here is an example of a strutless rear fender for a softail chopper, by American Classic Motors. 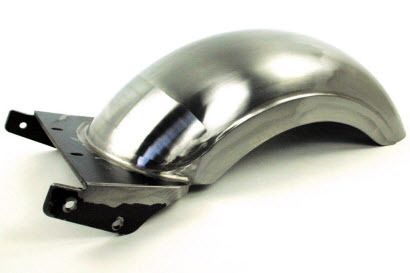 This fender is 9 inches and fits a 180 - 200 millimeter tire for a softail chopper or bobber. Front fenders: Know the tire size. Frame: What kind of frame are you using (softail, rigid, etc)? 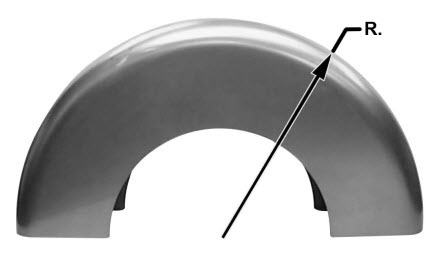 Strutless fenders may require welding a fender base plate to the frame. Do you want to build custom fenders? Do you want to see a master metalworker at work and providing you with tips and metalworking tricks? Here is one of our favorite DVD set that covers the details of building parts for your chopper or bobber. If you want quality 'how to' advice on custom choppers, building choppers, and articles on custom parts and more, Our FREE Mini Course Called 'Ten Mistakes Motorcycle Builders Make And How To Avoide Them' will more than impress you.